Your body needs lots of oxygen for endurance events, which is why your rate of respiration increases during exercise. Carbohydrates are one of the best sources of energy due to the efficient way they use oxygen. In fact, they use less oxygen for every kilocalorie of energy produced than fats or proteins, which make them an important food choice for athletes. However, it’s important to keep in mind that during intense exercise, you’re not only relying on carbohydrates for energy. For instance, 30-40% of your energy might be coming from fat stores. Carbohydrates, fat, and protein are always used together—which makes a nutrition regimen for athletes a lot more complex than forsaking one type of food in favor of another! Why not carb-load all the time? In order to maintain overall health and improve your fitness levels, it’s important to consume a balanced amount of foods. Fruits, vegetables, protein, fat, and carbohydrates are necessary for a healthy diet, so be sure to eat a wide variety of foods to get all your nutrients. Click here to learn how InsideTracker can recommend healthy carbohydrates that will help you optimize your physical performance! There is increasing interest in the “training low and competing high” plan, where athletes consume a low-carbohydrate diet in order to train the body to optimize energy metabolism systems when carbohydrate stores are limited. The rationale behind this plan is that it helps the body to effectively use the extra carbohydrates from carb-loading, which will help to maximize performance during a competition. One variation of “training low” is to exercise in the morning before eating. Whether to eat right before working out (the 30 minutes to 1 hour preceding exercise) depends on your goals. If you want to “train” the more aerobic energy pathways, exercising in the morning before eating may be beneficial—though you would probably also want to exercise several times during the week after eating. You will derive more energy from protein when you exercise in the fasted state, but you can also slightly increase your protein intake to counteract depleted protein stores. Essentially, it’s not necessarily beneficial or detrimental to eat before exercise—you just have to keep your goals in mind. Eating for sports performance and eating for health are two different matters! 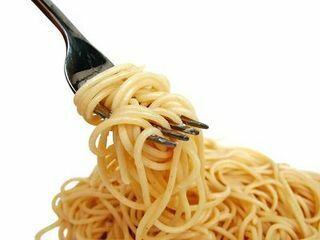 What is the science behind carb-loading? Runners and triathletes might be familiar with the term “VO2max”, or aerobic capacity. VO2max is a measurement of how much oxygen your body is able to supply to your muscles—which can limit your athletic performance if the amount is too low. In addition to your VO2max, the glycogen stores in your liver and muscles also affect your performance. These glycogen stores depend on your carbohydrate intake. Your body converts glycogen to glucose (a type of sugar), which your muscles use as a primary source of fuel during exercise. This means that your ability to exercise is limited by the amount of glucose in your body. After about 90 minutes of exercise, your body’s supply of glycogen is completely depleted, which puts you at a risk for “hitting the wall”, or feeling lethargic during your event. If your body doesn’t have enough glycogen to get you through an event, it will start to burn fat for energy. Fat burns at a much slower rate than carbohydrates, which will slow you down. You may have heard that low intensity exercise burns more fat than high intensity exercise. As you approach your VO2max, a greater percentage of the fuel comes from carbohydrates. But the longer your exercise lasts, the more your body draws energy from fat metabolism rather than carbohydrate metabolism. So high intensity exercise can burn as much, or even more fat, than low intensity exercise of the same duration. Exactly how should you carb-load? If you’re preparing for an event that will last longer than 90 minutes, such as a marathon or a triathlon, you should begin to increase your carbohydrate consumption two or three days before the event. This type of diet will help to build the glycogen stores in your body so that you will be adequately fueled for your event. However, don’t begin carb-loading earlier than that, because lengthy high-carb diet will increase water retention and make you feel sluggish. The general rule of thumb for carb-loading is that you need to be consuming about 60-70% of your daily calorie intake from carbohydrates, which can vary depending on your height, weight, and gender. For a 180-pound long-distance male runner, this would be approximately 1,800 calories, and about 1,500 kilocalories for a 140-pound female. In order to make carb-loading a little easier on your stomach, try to eat several small carbohydrate-heavy snacks instead of consuming one or two bigger meals. Keep in mind that carb-loading is not necessarily about increasing your daily calories; it’s about increasing the amount of carbohydrates in your diet. On the night before the race, you might want to avoid complex carbohydrates that are high in fiber, such as starchy fruits and vegetables, and whole grains. Eating low-fiber foods may not seem like a healthy diet, but athletes who carb-load with mostly high-fiber foods may experience gastrointestinal stress during a race. It’s best to eat a combination of complex and simple carbohydrates. Adding some protein to your meal will also help to boost your energy levels. Eating protein with your carbohydrates will lower the GI (Glycemic Index) of the meal, which will allow the body to release energy slowly and steadily. This is ideal for endurance events where you don’t want to max out on energy too quickly. If you’re an athlete who is interested in carb-loading before an event, InsideTracker can help you personalize your food intake. Based on your bloodwork results, InsideTracker will analyze your blood glucose levels, which are heavily dependent on your carbohydrate consumption. As stated above, the body converts carbohydrates into sugar during the digestion process. Overconsumption of processed carbohydrates like white flour and white rice will cause your blood sugar level to rise quickly. When this occurs, your pancreas releases insulin, a hormone that helps your body convert the sugar into energy. So, InsideTracker will be able to direct you to better sources of carbohydrates for carb-loading, such as whole grain food items, that will prevent your blood glucose levels from spiking. It’s important to note that carb-loading isn’t necessarily the best approach for every body and every level of exercise. Because there are many different variables to carb-loading, experiment with carb-loading before a smaller event, keeping track of what you eat and your results. As you add to your experience, follow whatever feels best for your body. For instance, carbohydrate loading may not be as effective for women as it is for men. Several research studies reveal mixed results, particularly for women. In order to get the same benefits as men, women may need to consume more calories during periods of carb-loading. A woman’s menstrual cycle may also change the effectiveness of carb-loading, but the reasons for this are not yet clear. If you’re considering increasing your carbohydrate intake, talk to your doctor or registered dietician before you start, especially if you have been diagnosed with diabetes. You may also want to experiment with different amounts of carbohydrates to find something that works for your unique physiology. Finally, if you’re training for a big event, remember that carb-loading alone won’t help you achieve optimal results. An overall balanced diet and effective exercise regimen will keep you healthy and improve your fitness level, and InsideTracker can help you learn how!